This blog, Humble Student of the Markets, turns one this weekend. Even though I now live in Canada, on this US Thanksgiving long weekend I would like to reflect upon my personal journey for the past couple of years and how Humble Student of the Markets came into being. I'm not going to say that success is insignificant, we know that's not true, but I can tell you, from experience, that if you look for happiness in a bank account, you're missing the bigger trade. The first few months were great. However, I discovered that I still had a market analysis itch that needed to be scratched. There were too many things that I wanted to say and didn't know who to say it to. The result was this blog. I began to write for myself, with no expectation that anyone would even read it. I named this blog Humble Student of the Markets for a couple of reasons. First, we are all mere students of the market, regardless of our experience level. Moreover, if an investor isn't humble - the market will eventually make him that way. Little did I know what a tumultuous year this would be. This past year has seen upheavals that would be worthy of telling my grandchildren about. We have just completed two consecutive trading days when the Standard & Poor’s 500-stock index rose more than 6 percent each day — the first time that happened since 1933. They followed the first two consecutive 6 percent declines since 1933. For the four days, the S.& P. is down 0.9 percent. We may not be accomplishing much, but it sure is a lot of fun. In this environment, VaR and other risk control estimates all go out the window. Why is the market so volatile? There are many explanations for this volatility. The most obvious one is the macroeconomic uncertainty that grips the financial markets. I have noted that many hedge funds have gone to cash for the remainder of the year. Given the decrease in “fast money” trading and the lack of conviction by other market participants, it is not surprising that daily volatility has risen. No doubt there is some element of truth in all of these explanations. I would like to suggest a far simpler contributing factor to this market volatility: lower stock price. Bespoke recently reported that the number of high priced stocks and low priced stocks are at levels seen at the last market bottom in 2002, no doubt a result of the market's severe downdraft. While this market decline creates a far larger universe of Phoenix candidates, the lower price per share of stocks also contributes to increased volatility. 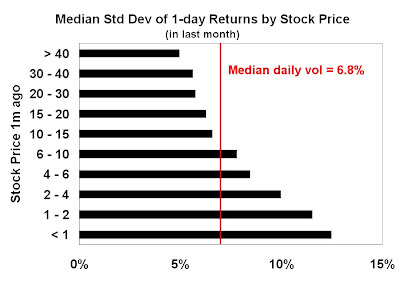 The chart below shows the median standard deviation of one-day returns in the past month for the components of the Russell 3000, categorized by stock price. As you can see, as the per share prices of stocks fall, volatility increases monotonically. Though not shown in the chart, I found that this effect can be seen whether you measure volatility using the standard deviation of daily returns, average daily percentage swings, or the difference between daily high and low. With the shares of such venerable names such as GM and C are trading at low to mid single-digits, it’s no wonder we are seeing huge jumps in daily swings. Last week the market broke down decisively below its October lows. In the ensuing panic, the S&P 500 melted down (ho hum, what again?) to levels below its 2002 lows. Amidst the carnage, the market is extremely oversold and long-term sentiment measures are at bear market extremes. With the caveat that long-term sentiment indicators can’t pinpoint the exact low on this bear, this is an indication that downside may be limited for this bear market. Financial planners tell their clients to build an asset allocation plan and to stick with it. However, there are numerous signs that individual investors are abandoning their buy-and-hold discipline. Barry Ritholtz pointed out that AAII data shows that individual investor stock allocations are at levels consistent with previous bear market lows. CNBC recently aired a segment on the Death of buy and hold as an investing discipline. In conjunction with that news, Mebane Faber's market timing system is shooting the lights out compared to a buy-and-hold strategy, with returns at all-time highs comparable to 1974 bear market low levels. These results are not surprising given the terrible environment for equities. Most notably, the decline in the S&P 500 has been as severe as any of the last fifty years, but it has occurred in half of the time. Typically declines such as the current one occur over two years, this has taken just over one. They seem to have thrown up their collective hands and moved into panic mode as they went on to say that market history may not provide a good guide anymore. In October, total dollar volume in over-the-counter stocks fell to less than 0.07% of total NASDAQ dollar volume, the first time it has dropped below 0.1% since the inception of the data in 1995. To be sure, shorter term sentiment indicators such as AAII are not at bearish extremes. Mark Hulbert came to a similar conclusion based on newsletter writer sentiment as well. This readings indicate that the bull is not quite ready to charge yet. My inner technician's interpetation of these conditions is that there is limited downside in the market. However, equities need to spend some time and base before the bull can revive again. You know the psychology is really bad when the market breaks its October lows and the press is full of stories about the upcoming Great Depression II and economic and social collapse. While this is undoubtedly a bear market, this is also a maximum frustration market where traders get whipsawed in their positions on a daily and hourly basis. Macro Man pointed out the one-day range for the S&P 500 on November 13 is roughly equivalent to the annual range for all of 2005. What could cause such a whipsaw? I have identified a number of positive divergences that indicate the market is in the process of forming a bottom. These signs, however, are medium term indicators and will not prevent the market from going lower from current levels. This whole crisis began in the real estate sector. Excess homebuilding, overly aggressive lending practices – we all know the story. The chart below shows the relative returns of the homebuilders against the S&P 500. An interesting thing happened in this latest downleg as the relative support levels seems to have held. The homebuilders are no longer leading the market down. This could be an early sign that the worst of the carnage may be over. As we all know, the excesses in the real estate market eventually showed up in the banking sector. A look at the relative chart of the KBW Bank Index (BKX) shows that the banks are outperforming the S&P 500 in this latest downleg. This is another positive divergence and indication that the market is trying to base and make a bottom at these levels. Some investors may quarrel with my conclusions from reading the above chart. The financial services sector, not just the more narrowly defined banking group, continues to underperform the market. The chart below shows the relative returns of the XLF to the S&P 500 and the XLF has broken down to new relative lows. The difference between the XLF and the BKX can be traced to the greater weights of the (former) investment banks and brokers in the XLF, which are dragging down returns. I interpret this as Mr. Market’s worries have shifted from the banking to derivatives and the worst of the storm may be over for pure banking, which represents some partial relief for the macro outlook. I pointed out in a past post the positive divergence shown by the more constructive market action of the Shanghai Index. In addition, Todd Harrison at Minyanville also mentioned a number of catalysts that could result in a rally, which would likely be very sharp. Also remember that there should be support coming in at the 770 level on the S&P 500, which was the 2002 low. Stocktiming.com refreshes its analysis on a weekly basis and therefore the link to the Chinese market analysis will be overwritten on Monday November 24, 2008. Stocktiming.com has kindly supplied me with a new link which doesn't expire next week. The link in my previous post has been corrected. China the next shoe? or the final capitulation? After a recent visit to China, Nobuyuki Saji, chief economist and equity strategist for Japanese investment bank Mitsubishi UFJ Securities, issued a report warning that China could be on the verge of pushing the world into a deflationary spiral. The problem? Swelling industrial overcapacity, which threatens to undermine prices both for China's exported goods and its imports of raw materials. He estimated that China's production is running as much as 50 per cent below capacity, as many industries that have been expanding rapidly are now being hit by slowing demand both domestically and abroad. Based on his estimates, China alone represents 7 per cent of the global supply/demand gap. I had called for a rally into year-end and then another leg down in the stock market. This Chinese overcapacity story, if it becomes widespread, could be the catalyst for the next downleg. It would serve to take US and European stocks down further. It would also be extremely negative for commodities of all types, as the hopes of commodity demand from future Chinese infrastructure investment would evaporate. China slowdown: The final capitulation? One ray of hope, however, comes from the analysis from Marty Chenard of stocktiming.com. He recently wrote a piece indicating that the Chinese stock markets may be in the process of forming a bottom. He highlights the point and figure chart of Shanghai Composite as an example. 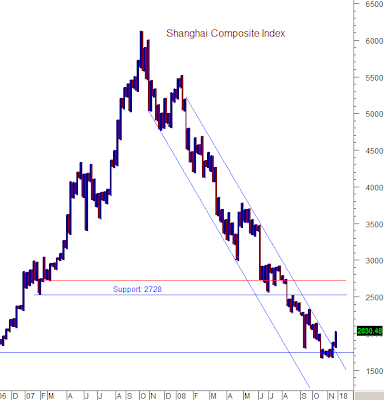 The Shanghai market recently broke out of a downtrend, indicating that it is in a bottoming process. If we were to juxtapose the analysis about China’s overcapacity to this technical formation, it suggests that the news is already discounted in the market. After all, when the story makes it to the pages of a Canadian newspaper, how late are we in the trade? (My Asian based readers are invited to comment). Perhaps the final down-leg in the US equity market will occur when the China overcapacity story becomes widespread and hits the pages of US newspapers. That would serve to prompt the final capitulation that washes out the last weak and desperate holders of equities to sell out and form the basis for a new bull market. Addendum: Stocktiming.com has kindly supplied me with a link so that the Shanghai analysis doesn't expire. The link in this post has been changed accordingly. From a bottom-up perspective, stocks look cheap and they are getting cheaper. My list of stocks that are worth more dead than alive is growing daily. Yet macro worries continue to mount. The case of Anvil Mining serves as a Rorschbach inkblot test for investors. 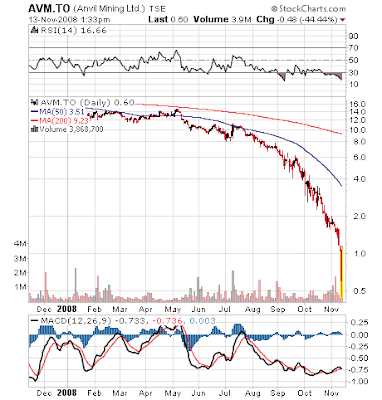 Anvil is a small cap Canadian miner, listed in Toronto and also trades pink sheet. The company's principal assets consist of three copper mining operations in the Democratic Republic of Congo. In Anvil's case, the impact of these events has been compounded by uncertainty regarding the review of mining agreements by the Government of the Democratic Republic of Congo ("DRC"), operational difficulties at the Dikulushi underground mine, delay in the commissioning of the Electric-Arc Furnace ("EAF") at Kinsevere and increases in operating costs. Oops! The stock plunged over 40% from the previous close after the release of those results. On the other hand, an opportunistic value investor would examine the financials of the company and note that with the stock under $1, it trades well under net-net working capital (current assets less all liabilities) of US$2.76 per fully diluted share. As an investor, stare into the Anvil Mining metaphorical inkblot and tell me what you would do. That is the investor dilemma in today's market. Disclaimer: I have no position in Anvil Mining and this is not a recommendation to either buy or sell the stock. Are they even slamming the barn door properly? I have repeatedly hammered on the theme that quantitative modelers need to spend more time thinking about the assumptions behind their models (see my recent posts What actually happens in the long run and There are no models for all seasons). Analysts need to understand under which conditions the assumptions hold and under which conditions the model will fall off a cliff. Morgan Stanley is seeking Quantitative Modelers to join the new Market Modeling Group at Morgan Stanley. Candidates must have demonstrated excellence in mathematics, programming, statistics and Quantitative modelers must have a background which would enable them to develop models that would positively impact the revenue-generating capabilities of their trader counterparts. While it is admirable that Morgan Stanley is forming a Market Modeling Group, this job description seems to call for a junior or intermediate level quant (3-5 years experience). I hope that this isn’t a case of the blind leading the blind and there are people in the firm with the sufficient maturity and “grey hair” to lead the group and understand the nuances of modeling. Regular readers of my blog are aware of my skepticism about the value of hedge funds as investments. While I have the greatest respect for some hedge fund managers who are capable of adding significant value, aggregate hedge fund returns have been far too correlated with S&P 500 returns and undiversifying for them to justify their fee structure. See my some of my past comments here, here, here and here. Today, it gives me no pleasure to see the hedge fund industry in disarray and implode. Returns are going south, redemptions are rising and the fee structure is under scrutiny. Investors didn't get the results they expected. In addition, hedge fund industry employment should not have ballooned the way it did in the boom years and now the downward adjustment is going to be painful for a lot of people, many of whom didn't make the obscene amounts of money reported in the press. Recently I saw the news item from the WSJ indicating that trend following Commodity Trading Advisors (CTAs) exhibited positive returns for the year. No doubt some investors will allocate funds to this group of managers in search of a “safe haven”. A few years ago, I managed equity market neutral portfolios at a firm that was mainly known for commodity trading using trend following techniques, which are well described by Michael Covel in his book [Trend Following]. During my tenure there I noticed that while the commodity positions were spread out among various futures contracts they often amounted to a few macro bets (i.e. on interest rates, on the US$, etc.) I came to the conclusion that these models were identifying macroeconomic trends that are persistent and exhibit serial correlation, which creates investment opportunities for patient long-term investors. For example, if the Fed is raising rates the odds are they will continue to raise rates until they signal a neutral or easing bias, i.e. there is a trend to interest rates, which is information that investors can use. The key risk in this class of models is knowing when to exit the trend, as short and long term reversals can be devastating to the bottom line. Trend following models identify and capitalize on long-dated economic trends, which are persistent. However, academic studies show that an investor can replicate those effects in a relatively simple fashion with techniques that are in the public domain. In other words, CTAs just don't seem to have any alpha on an after fee basis. America has a new president-elect. Barack Obama has been embraced not only by traditional Democrats but by many social liberals/fiscal conservatives (just one of many examples here). Expectations are extremely high. It’s irrelevant whether the woman in the TV clip believed that Obama’s policies would directly or indirectly alleviate her concerns. The world seems to be expecting miracles from the new president-elect. Can St. Barack of Chicago deliver? The atmosphere today is somewhat reminiscent of the elevation of Nelson Mandela to the presidency of South Africa. During the election people stood in line for hours to vote. There was no violence. People were just happy to be enfranchised. Foreign election observers came away with tears in their eyes. He had magnanimously stated that he held no animosity towards the whites and said in so many words that we are here to build a new nation. Yet South Africa faced many economic challenges that it was not able to solve. The new Obama Administration also faces daunting economic challenges today. The fiscal implications of the Obama’s election promises remain problematical. Longer term, America is a country with high levels of income inequality and low social mobility, which can result in a class structure that inhibits innovation. That issue was raised by Larry Summers, who is rumored to be a leading contender for Treasury Secretary. In addition, the US government seems to be continuing down the inflationary path of serial bubbles. If the Obama Administration is to be truly transformational, then the first signal would be the choice of a Treasury Secretary. There are rumors that a new nominee would be named as early as this Friday. In the case of my aforementioned post about long run equity returns, the world doesn't seem to be on the verge of war or revolution, so the assumptions DO hold. Macro fears are overblown. The bottom-up investors are right and stocks are cheap and are undergoing a bottoming process here. With those comments in mind, this is another in a series of warnings for quantitative modelers to examine their model assumptions. Do you know what your models are doing? More importantly, are they designed for the upcoming market environment? Back when I was young and naïve I believed that quantitative investing was easy. I could build quantitative models, plug them in and they could run on autopilot. As we saw with the recent mortgage debacle, models don’t work in all environments and analysts need to continually question the assumptions behind the models. A case in point, this market and economy will turn up one day (which I believe will occur in the first half of 2009). For the purposes of this discussion, the timing is not relevant. Whenever the recovery happens we will see a Phoenix effect that will see the low-priced shares of near bankrupt companies spurt to eye-popping levels. Many multifactor quantitative equity selection models will perform poorly during such a turnaround period. Most mainstream quant models tend to buy stocks of companies with positive cash flows, positive earnings momentum, positive estimate revisions and good potential for positive earning surprise, cheap valuations, good GARP characteristics and so on. Phoenix stocks have terrible balance sheets and highly negative earnings (how does a P/E of -5 strike you?) What's more, low stock price or low trading volume that get screened out because of investability criteria. As a result, most multifactor quant models will simply not buy Phoenix stocks. When the junk flies, as we saw during the Tech bubble and in 2003, multifactor quantitative equity stock selection models fail. I wrote that Jeff deGraaf reported in late 2003 that the return spread between the lowest and highest decile of the stock price factor was about 70% - an astounding return. If your multifactor stock selection model is as I have described, then be prepared for a year or so of bad relative performance. Inflation vs. deflation: How would your model behave? One of the keys to success in quantitative investing is to have an understanding of the macro issues. I wrote in a recent post that we are facing a fork in the road between inflation and deflation and the result was highly dependent on policy and market response. Given these hugely disparate outcomes it would be surprising that the same quant model would behave the same way in both environments. In a deflationary environment, cash is highly prized. Companies with clean balance sheets and low financial leverage tend to outperform. When prices are falling, the ability to maintain margins would depend more on the power of a brand and the product and service a company is selling. Even with the consumer staple sector, there are differences. Nielsen recently put out a study showing consumer product categories were more recession resistant than others (e.g. beer is but tobacco is not). By contrast, companies with levered balance sheets tend to win in an era of rising inflationary expectations as debt becomes a cheap source of capital. Hard assets and commodity producers are also winners in inflationary eras as they can maintain or even raise their margins in the face of rising prices. Middlemen lose. When we went through the recent bout with inflation, we heard numerous stories from the likes of Starbucks and Hershey’s about the cost of their inputs (milk, cocoa, etc.) squeezing their margins. Yet it is precisely these companies that would tend to stand up better in a deflationary period because of the strength of their brands. A sea change could very well be underway, is your model suited to all macro backdrops?